From its foundation, Rumworth has developed a very distinctive style of dancing. This was no accident. It was decided right from the start that we would dance at a strictly measured pace, which would allow the dancers maximum freedom of expression within the disciplined format of each dance. This means that we dance a lot more slowly (or maybe “less fast” would be more appropriate) than most North West sides. The distance between each man and the man behind him (or in front of him) is the same as the width of the set. This means that the front four dancers, and the back four – and indeed the middle four – each form a perfect square. It also means that the set is three times as long as it’s wide. When accepting a booking, we always try to let the organisers know that we need a big space to dance in. Unfortunately this message does sometimes fail to get across. 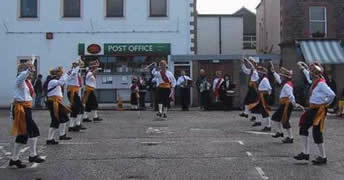 We are often asked to dance in a spot that is fine for a six-man Cotswold team, but too small for Rumworth. We’re not being arrogant or awkward, or playing up to the image of stroppy Northerners; indeed we have never actually gone as far as to refuse to dance in a designated spot (unless the surface is unsuitable for clogs – but that’s another story The obvious example is that you can’t dance on grass in clogs; they don’t slide in the same way that rubber-soled shoes do, and this can cause injury.). It’s just that when we’re invited to put on a performance, we think the people who have invited us expect us to do it our own way. Our repertoire currently includes nine dances. Three of them use garlands (decorated semi-circular hoops), one is a stick dance, and the other five use the distinctive pieces of kit that are known as tiddlers, ropes, slings, or mollies. “Tiddlers” and “mollies” are generic terms; ropes, as the name implies, are made of rope and are held in the hands and waved or swung, while slings have a loop that goes around the hand or fingers and are swung at various speeds. In Rumworth we use “mollies” as the generic term. We have two sets of ropes and one set of slings, with each set of ropes being used for more than one dance. Slings consist of a cotton sleeve which is stuffed, traditionally with cotton waste that was obtainable from the mills where many dancers were traditionally employed. Both ropes and slings are about ten or twelve inches long, and decorated in team colours (red, white and blue in the case of Rumworth). We were quite amused by one newspaper report that described our ropes as “rope-like objects”. That was one journalist who didn’t seem to know just how accurate his report was. Most (but not all) of our dances involve a polka step. It is particularly effective when wearing clogs, which tap out the distinctive rhythm that has been characterised as “tomato soup”. Apart from the polka, our dances include a number of caper steps, and even walking is not unknown. Note that there is no such thing as No. 1 Polka or No. 1 Garland. Most of the dances were originally devised (or are published) for eight dancers. Some of them, notably Holme Chapel and Deane Memorial, can be and have been danced with twelve.